Two books, 90 illustrations over 1000 emails but my illustrator and I have never met ... until now! Eighteen months ago I began to published my first book and needed an illustrator. After hours of research, I stumbled onto a website that connected people like myself with artists, graphic designers, and illustrators. I posted the work I required and Dawn Larder replied with such enthusiasm for the topic of the book, that I warmed to her at once. As soon as we began to work together on Secrets of the Snow Globe - Vanishing Voices, I realised what a special lady Dawn is! Her hard work, talent and enthusiasm shines through her beautiful artwork. She is incredibly patient and I have been truly blessed to work with her! Our partnership is made more remarkable by the fact that she lives, for much of the year, in Spain. Drawing Swiss snow scenes while in the sweltering Spanish summer heat, I'm sure, is no mean feat! Until now, we have never met or even spoken to each other. I am really excited about the launch of Secrets of the Snow Globe - Shooting Star because it is the first time that we shall meet face - to - face! Find out more about Dawn and her work at The Glimmer Twin Art House. I had a wonderful morning a few weeks ago at Eastleigh Library, chatting to parents and children about my book, answering questions and giving readings. It was fantastic to meet so many enthusiastic young readers. Well done to all of you who took part in the craft activities! Take a look at their fab pictures! A huge thank you to everyone who came along to Quob Stables, and made Daisy's Day a special event! Lots of fun was had in the pony arena as riders, large and small, learnt new skills. Hands up if you managed to touch your pony's ears? Zoe, from Moxies Magical Faces, impressed everyone with her fantastic face painting. Very realistic! Daisy stood patiently as the children learnt about why I chose to include her a key character in the book. She behaved impeccably as she was patted and fussed by many little hands. It's a hard life! Congratulations, Yasmine Taylor, winner of the drawing competition to draw a magical or mythical horse! We love your magical land and horse! A special thank you to the staff at Quob Stables who made today possible. Finally, thank you to everyone who bought a book today. I hope you enjoy reading about Daisy! If you couldn't attend and would like to purchase the book, please visit my online store. 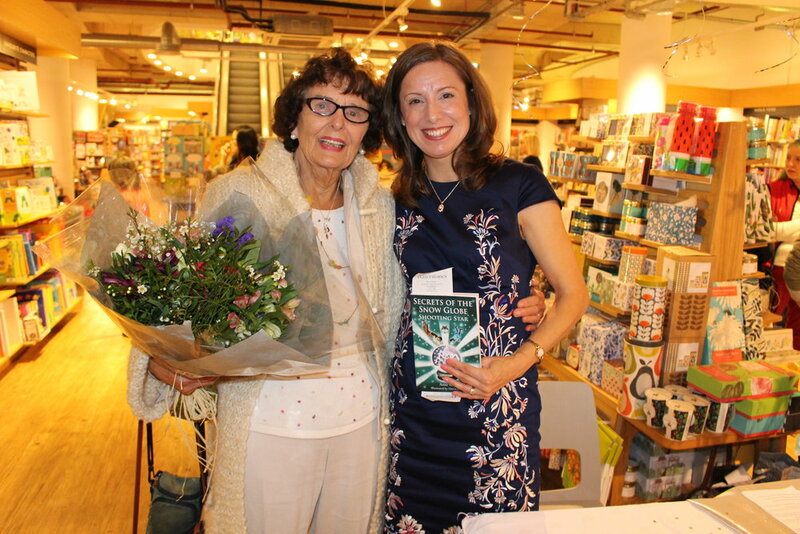 Over 130 friends, family and special guests joined me on the 1st of October to celebrate the launch Secrets of the Snow Globe – Vanishing Voices. I was particularly honoured to welcome the Mayor and Mayoress of Eastleigh. It was lovely to meet them and a joy to share this special event together. The Mayor and Mayoress of Eastleigh joined me on stage to give a short presentation along with Barbara Large, MBE (my tutor and editor) Daniel (representing Fryern Junior School) Jess Zabaidi, (representing the charity, Smile Support and Care) and John Groves (Elder at Hope Church Winchester). After a warm introduction from John, I spoke about what inspired me to write the book. I also used the opportunity to thank those who had supported me throughout the writing and publishing process. On World Book Week, 18 months ago, I read an early draft of Secrets of the Snow Globe to the current year 4 children at Fryern Junior School. At the end of my visit to the school, the children had asked, ‘Where can we buy the book?’. I am sorry it has taken so long! To thank them for allowing me to share the story at this early stage, the Mayor of Eastleigh presented copies of the book to their representative, Daniel. The launch was a great opportunity to support the local children’s charity, Smile Support and Care. Jess Zabaidi, spoke about the origins of the charity and how they support families with disabled children. I am delighted that we raised £200.00 via book sales on the day for Smile. Thank you to everyone who bought a book! 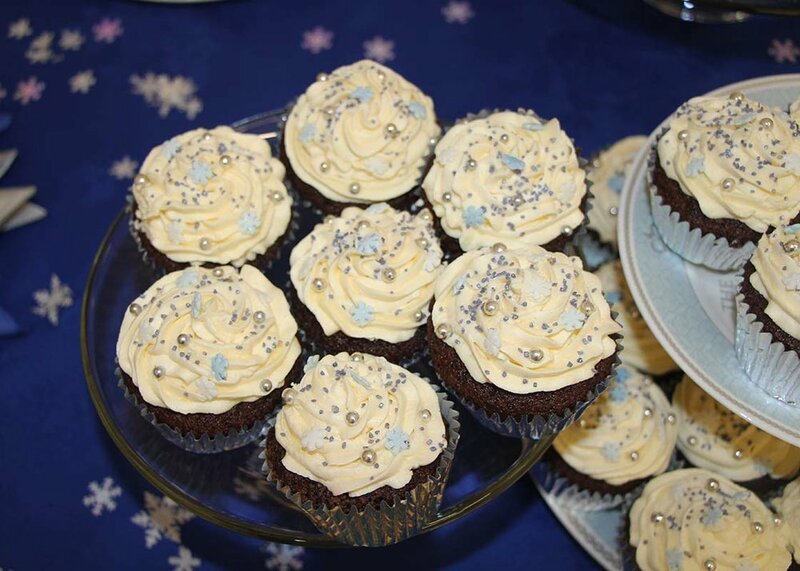 Following the presentation, guests enjoyed mingling and reading the display ‘The Story Behind the Story’ or relaxing with coffee and snowflake cupcakes. 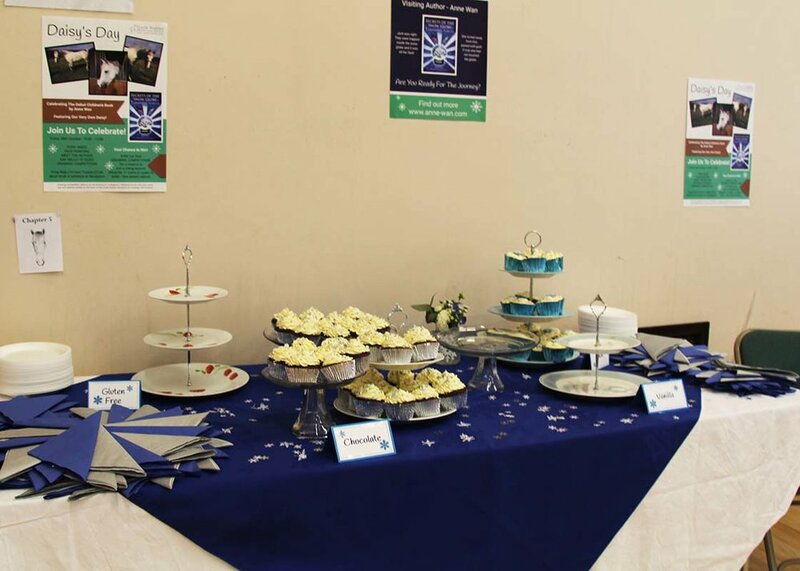 With four different cakes to choose from, there was something for everyone, although it is rumoured that some of you managed to sample all four! Well done! The afternoon had a magical atmosphere, thanks to my talented friend Louise, who decorated the hall beautifully. The illuminated vases, filled with translucent gel balls, caused peculiar fascination among the children, who couldn’t resist having a feel! There was a real buzz of energy as children made their own snowflakes with paper cut outs, lolly sticks, beads and sparkly gems, created castles or designed their own fantasy, snow globe worlds. The ‘Castle Corner’ proved to be particularly popular as children played with castle sets or built their own from giant Lego! Thank you to everyone who came and made it a joyous and memorable occasion! Recently, I heard about the work of the charity, Home-Start. I was impressed by the charity’s commitment to creating stability within the home for vulnerable children, and by the range of services that they offer to support families who are struggling. As a primary school teacher, I appreciate how important it is for young children to have a stable home environment. As a mum of three, I understand how tough this can be! I am delighted to announce that in support of Home-Start’s fundraising Snowflake Appeal, Secrets of the Snow Globe – Vanishing Voices will be available to buy via the Home-Start website from the 1st Nov – 31st Jan. 50% of sales made through the Snowflake Appeal, will be donated to the Home-Start. I hope you will join me in supporting this valuable work!